Yesterday in the Czech town of Žatec approximately 500 people gathered to honor the memory of the Romani man who died there last week after a conflict in a local pizzeria. Most of the predominantly Romani crowd then proceeded to the site of the unfortunate incident. An almost entirely male group of local customers of the business and other local residents were waiting outside the pizzeria, several of whom were wearing clothing associated with right-wing extremism (see the PHOTO GALLERY below) and who were clearly intent on not allowing the Romani people to continue lighting candles at the improvised memorial outside the restaurant that has been visited since the man died there. Police anti-conflict teams and riot units prevented any physical conflicts from occurring between the two groups. Louny Police spokesperson Jaromíra Střelcová has said an expert opinion will determine the cause of death in this case and that the initial autopsy has ruled out third-party involvement. The unfortunate death happened on Tuesday, 18 October. According to the testimony of eyewitnesses contacted by news server Romea.cz, the young Romani man entered the pizzeria behaving very strangely and unpredictably. According to some sources he was also aggressive. Allegedly the Romani man approached a table where several girls were sitting and bothered them. According to one eyewitness, a customer then kicked him in the neck. Approximately four other customers are said to have then assaulted him. One customer is said to have continued beating the man even after the local police arrived and also intervened. The young man subsequently died. "I simply do not believe it. If this had been a majority-society person, then certainly six people would never have grabbed a hold of him and beaten him. I simply do not believe it," Jan Čonka, the organizer of yesterday's gathering, said. Police have CCTV footage available from the restaurant as well as other video footage taken by eyewitnesses and their testimonies. The owners of the pizzeria closed the business for almost one week after the incident and have been targeted by several members of the Romani community with insults and threats, as have members of their staff. Memorial assemblies took place elsewhere in the country yesterday as well. The video footage below is from Ostrava, the third-largest city in the country. In the town of Jihlava, a peaceful half-hour long event called "Reverent Assembly of Solidarity for the Victims of Violence" was attended in Gustav Mahler Park by approximately 120 people, most of them Romani, including many families with children. 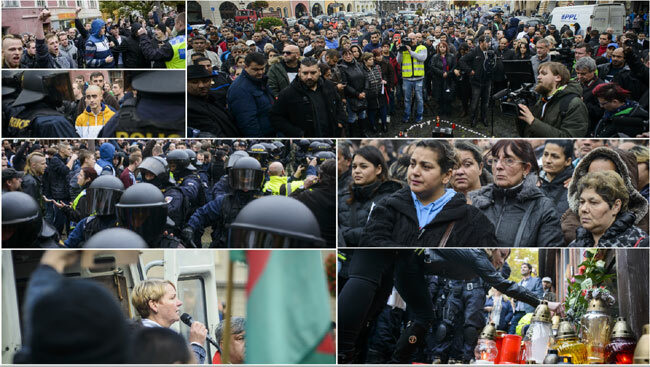 Speakers there talked about the death of the Romani man in Žatec, the circumstances of whose death have yet to be clarified, and asked that the case be thoroughly investigated. "Many people are asking: Why did he die?" one speaker said. Those attending observed a minute of silence for the deceased and lit candles by his photograph. In the Smíchov neighborhood of Prague approximately 60 Romani people assembled in front of the Church of Saint Václav on náměstí 14. října. The event was convened by the Roma Democratic Party (RDS). An improvised memorial was created there with candles and Romani flags beneath a street lamp. "The main reason for this assembly is to honor the memory of this youngster and also to join the call for this incident to be properly investigated," Ladislav Sivák of the RDS said. Sivák also drew attention to a case in which police officers allegedly beat up three Romani men for no reason in the Černý Most neighborhood of Prague. Those attending said they want to enjoy the same rights as majority-society people and complained that official institutions are not interested in solving the problems experienced by Romani people in the Czech Republic.